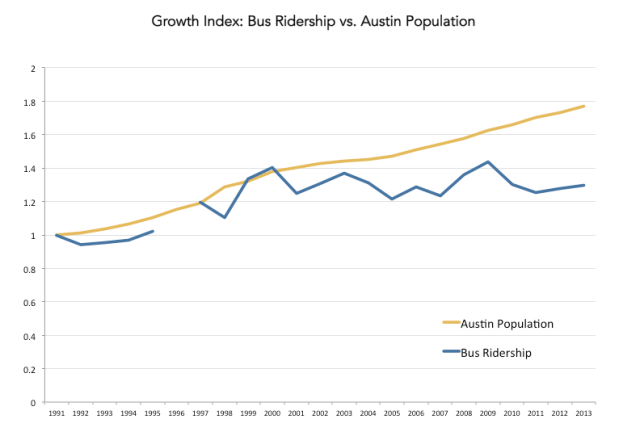 A recent post at Keep Austin Wonky asks why transit ridership in Austin seems to be stagnating even as the region grows at a healthy clip. Julio Gonzalez Altamirano says it doesn’t seem to be gas prices or transit funding, but something about the way the city is physically developing that’s hindering ridership growth. Julio says that for the last 15 years, population has increased 34% in the region. Because data from LED is only available from 2002 on, that leaves us with a 13 year period. But the growth in jobs in that 13 years has been 26% or ~675K to ~852K according to LED data. But for downtown, which I looked at as West of I-35, North of Barton Springs Road, East of Lamar, and South of MLK employment growth is much smaller. Only an 18% change, from ~112K in 2002 to ~132K in 2011. The share of employment that resides in this downtown sector has gone down too. In 2002 it was 16.5% of total jobs in the region, while in 2011 it was 15.5% of total jobs. 1% isn’t huge, but its enough to show that employment sprawl is a big issue. And if you depend on employment to drive transit ridership, and your #1 market is losing share, it gets hard to serve. So in addition to getting more housing in Austin’s core, I would argue that for VMT reduction, getting employment into the core is just as important. Right now people are driving to Round Rock or 360 or many other places. Create centers, serve them with good transit, and the ridership will grow. Elsewhere on the Network today: Bike Portland celebrates the 10-year anniversary of Portland police’s crosswalk enforcement program to protect pedestrians. Mark Brown at Carfree Dallas reports on what he’s learned in one year living car-free in the Big D. And Market Urbanism digs into the relationship between NIMBY constraints on housing supply and gentrification. Transit Ridership Slumping? Not in Canada. It's not complicated: Canadian cities run better, more abundant transit service than American cities.